She was the force behind Kim Ricketts Book Events, bringing books to life and introducing them to everyone from her three children to a cast of thousands. Kim Ricketts’ passing Monday, after battling a tough cancer diagnosis, drew tears from Seattle’s food community. It also brought words of warmth from the broad circle of fans who appreciated Kim’s kindnesses, her intellect and her humor. Among them, chefs and cookbook authors from near and far who came together to host the “Cooks & Books” dinner events dreamed up and facilitated by the woman who knew how to think big and make the wide world of books a very personal place for each of us. A memorial service is pending, as is a lengthier Seattle Times tribute. 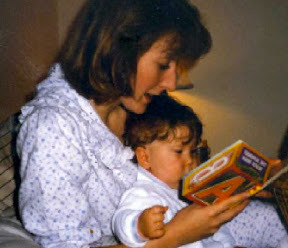 Kim Ricketts reading in bed (left) taught her children well. The rest of us, too. 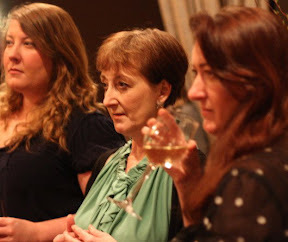 In photo at right she’s flanked by her daughter Whitney Ricketts (left) and author Kathleen Flinn last month at a Kim Ricketts Book Event at the Palace Ballroom [photos courtesy Ricketts family].